Rice | Can't Believe It's Allergy Free! This is an easy-to- prepare meal. 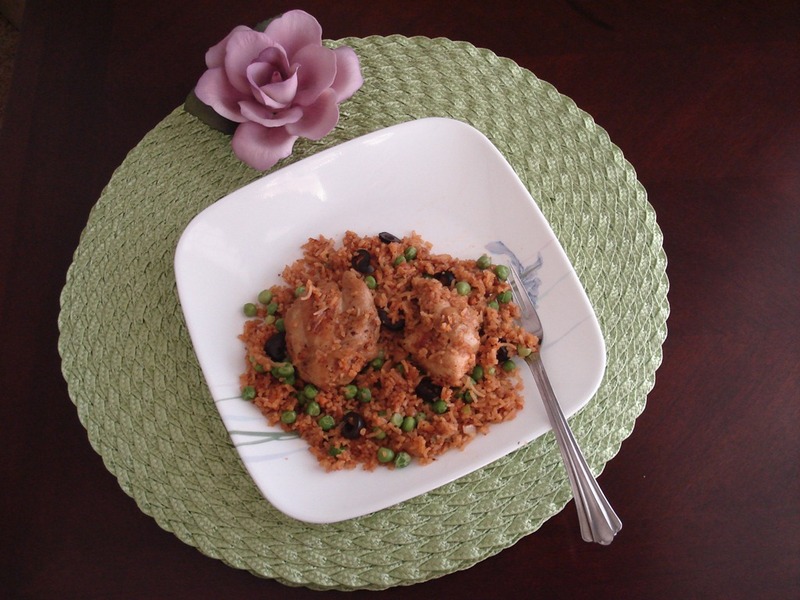 It combines the nutrition of chicken with the goodness of veggies and the comfort carbs of rice. Add a simple green leafy salad to enhance wholesomeness. What can be better than something so healthy and perfectly delicious? 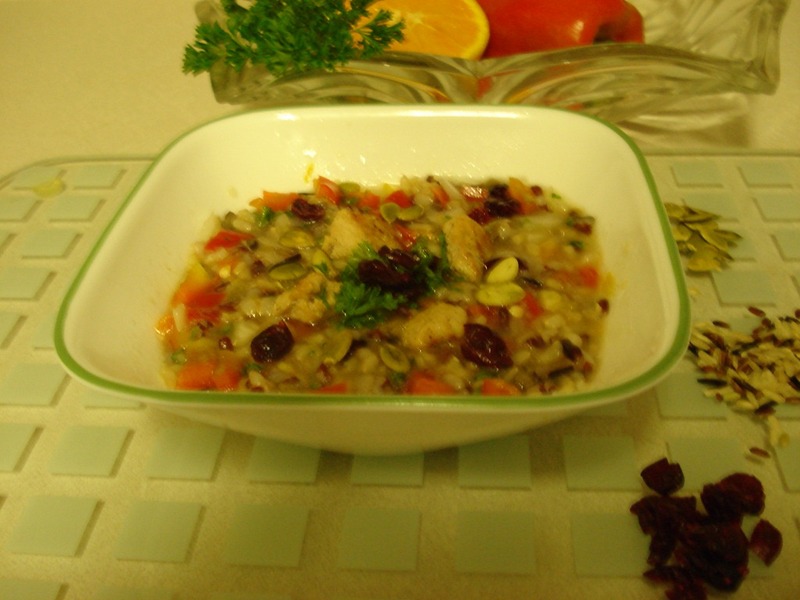 Transfer sauted rice and veggies onto chicken pieces in saucepan. Pour hot liquid over chicken and rice. Turn heat to low, and cook covered for about 3-4 minutes, top with remaining cheese, cover again and cook for 2 minutes more, or until all liquid has been absorbed. Turn off heat. Wait for about 5 minutes before removing lid. This is a satisfying comfort food. Serve a favourite hot soup with this cold salad, and you have a wholesome meal for everyone at the table. If wild rice is not available use brown rice, preferably the basmati variety. 3 cups cooked wild and brown rice blend. (one cup uncooked rice will yield almost 3 cups cooked rice). 1 medium red onion, finely chopped. Gently stir in 1 cup washed and rinsed wild and brown rice blend in 3 cups boiling water, using a large saucepan. Reduce heat, cover and allow rice to simmer for 30 minutes. Uncover and check to see if rice is well cooked, or needs a little more water. Cover and cook for a few more minutes if required. (I pressure cook for 10-12 minutes). Fluff cooked rice with a fork, and allow it to cool. chopped onion, bell pepper and parsley. In a smaller bowl, whisk together orange juice, rice vinegar, olive oil, orange zest, garlic, brown sugar, salt, and cayenne pepper. Pour and mix gently into the rice and turkey mixture. Make a few hours ahead and refrigerate before serving. A quarter cup of cranberries yields just 90 calories. Cranberries are a good source of Vitamin C, a quarter cup serving gives us about 20% of our daily requirement. Pumpkin seeds are rich in Vitamin E.
Parsley is a good digestive aid, and is full of goodness—Vitamins C and A, iron, copper and manganese. Rice, the most non allergenic of food grains, is a staple in any allergy free, gluten free diet. Mostly, it is an essential accompaniment and a good bulk food which provides eating satisfaction. When rice is milled and polished (such as white rice), it loses some of its nutrients, especially the B group vitamins, Vitamin E, iron and a few other micronutrients. White rice sold in stores in the US is generally fortified, the lost nutrients added on and prewashed, so further washing is not required. Washing of rice also diminishes nutrients, but it is necessary to wash rice thoroughly, rinsing out the water 3-4 times, in order to remove impurities and pesticides which may have been used. Parboiled rice retains more nutrients than polished, white rice. 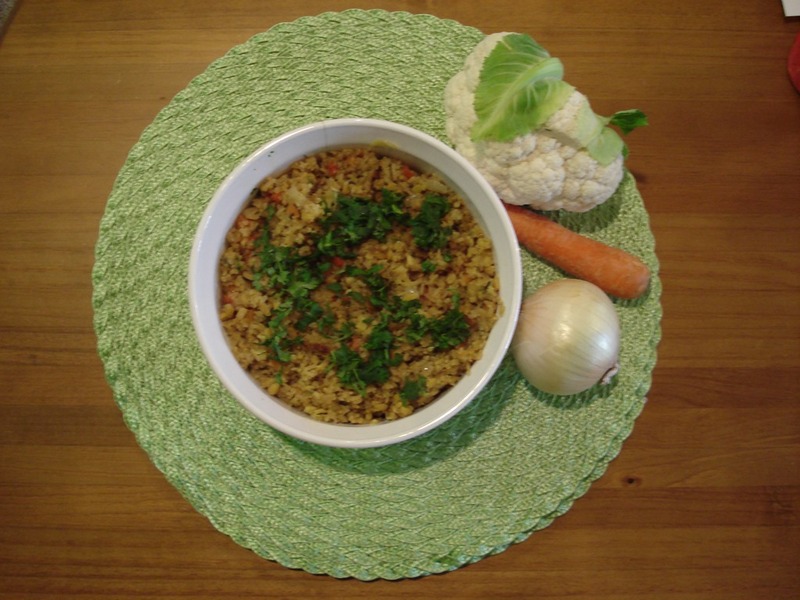 Brown rice is richer in most nutrients and especially in fiber. but protein content is more or less similar to that in white rice. Although rice has less protein than wheat, the quality of protein in rice is generally superior and is better assimilated by the body. Of all the varieties of rice, basmati has the best kinds of complex carbs, which are burned slowly, thus providing longer lasting energy. Basmati rice has a Glycemic Index which is lower than almost all other kinds of rice. The stickier the rice, the higher it is in starch content, and will therefore have a higher Glycemic Index. Wild rice, which is more of a gourmet rice has excellent nutritive value. It is rich in protein, fibre and minerals like iron, potassium, magnesium and phosphorus. It is actually a seed of a variety of grass that grows around lakes and rivers. In the US, wild rice comes from a type of grass that grows wild in the Great Lakes region. It has a nutty flavour and a chewy texture. Because wild rice is pricey, it is often mixed with other grains, most often with brown rice as both require the same amount of cooking time. It also needs to be washed thoroughly. About three times the amount of water works well for wild rice. 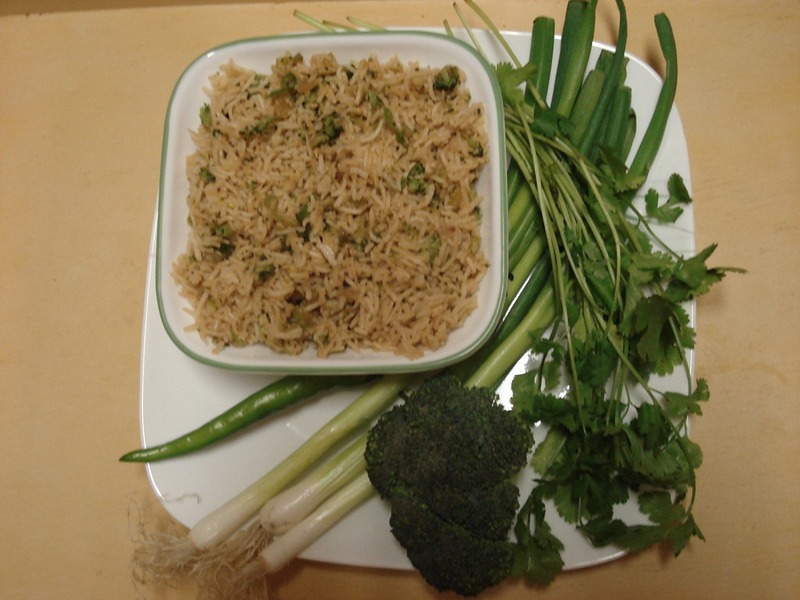 Generally, rice has to be used more as an accompaniment, so that other nutritious foods go down well. Although I use dairy and soy in some of my recipes, I give substitutes whenever possible, but I completely avoid other allergenic foods such as wheat, eggs, nuts and fish. If you can have eggs or fish, just go ahead and add to this rice recipe. I use the larger variety of green chilli peppers as they are milder. The small ones are much more pungent and packed with fire! Cook rice with 2 cups water, 1/4 teaspoon salt and lemon juice. The lemon/lime juice will prevent rice grains from becoming sticky, and will enhance flavour. Some varieties of rice may need a little extra water. Fluff out the cooked rice with a fork and allow it to cool a little. In a large wok, heat oil on medium heat and add crushed garlic and very finely chopped green chilli pepper. Add broccoli, sauté a little, then cover and cook for a minute. Add cooked meat, green onions and chicken/vegetable broth. Add soy sauce and chopped cilantro. Gently fold in the rice. Mix all ingredients well, then cover wok for a couple of minutes or so to allow the fried rice to warm well and absorb flavours. A great dish for the whole family!